Kakao, the operator of South Korea’s most widely used mobile messenger service, KakaoTalk, said Wednesday that it will begin developing a medical big data platform in partnership with the Asan Medical Center in Seoul. The envisioned big data platform would pool and consolidate different kinds of medical records and other information into one integrated system, so they can be utilized and analyzed by interested parties. 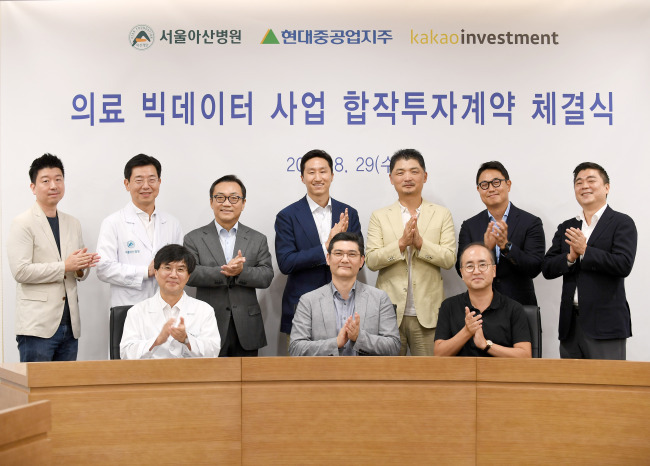 Kakao Investment, Kakao’s venture investment arm, has signed an agreement with the Asan Medical Center and Hyundai Heavy Industries Holdings, to co-establish a joint venture for the task. The JV, tentatively named Asan Kakao Medical Data, was formed with Kakao Investment and Hyundai Heavy Industries Holdings each putting forward 5 billion won ($4.51 million). It will develop a big data trading platform that will systematically collect and manage critical medical data generated in Korea, including electronic medical records, clinical trial records, and information generated by medical devices. The platform will be developed by Kakao using its expertise in artificial intelligence and platform development, while Kakao and Hyundai will work together to devise viable business models for the platform. “By combining high-quality medical data with Kakao’s technologies, we hope to create a viable ecosystem for the growth of the AI-based medical big data business,” said Kakao Investment CEO Park Ji-hwan in a statement.